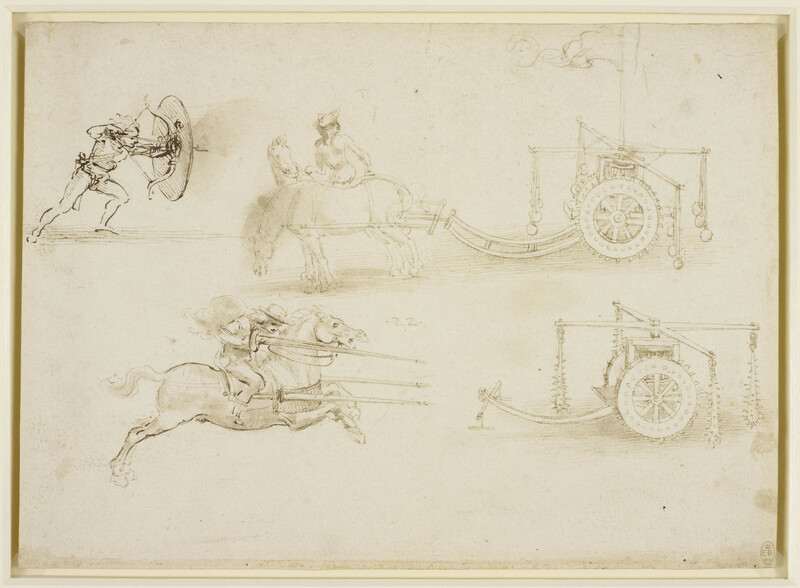 A sheet of several designs for chariots and weaponry: an archer aiming an arrow through the aperture in a shield, which is part of his bow; a design for a war-machine which, when pulled by two horses, will cause canon-balls to fly out horizontally; a man on horseback charging with a set lance and two other projecting lances fixed to the horse's saddle; the same war-machine as above, with the canon-balls replaced by spiked clubs. Melzi's 22. Milan was Italy’s leading centre for the production of arms and armour, and soon after Leonardo’s arrival in the city he began to sketch designs for all manner of weapons – lances, chariots, enormous catapults and crossbows, guns, cannon and mortars. It is unlikely that any of these designs were put into practice, and they may have been intended instead for an illustrated book on warfare.